...any publicity is good publicity. That said, it it's Pennsylvania and it involves football there is some likelihood that it's not "good." Note to school districts: If you are going to produce a field-side banner aiming at increasing sponsorship via the sales of other similar banners, make sure that your own product is spell checked -- and word checked -- before it goes to the printers, and after it comes out. In particular, avoid the mistake made by the Red Lion Area School District -- a school district in Pennsylvania -- in the banner above, as first noted by Deadspin and originally posted to Twitter by Ryan Petzar. Go ahead and read the text on that sign twice. The spelling mistake is as embarrassing as it is innocuous. Clearly, Red Lion officials were advocating that they were a purveyor of public education, not "pubic education." That was confirmed by Don Dimoff, the marketing and communications manager for the Red Lion School District in a conversation with Prep Rally on Thursday. 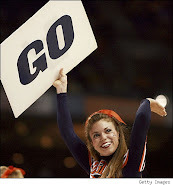 "To be honest with you, all that really happened was the sign company made a spelling error, and in the midst of putting it up for a football game some of the other people missed it," Dimoff told Prep Rally. "As soon as we found out about it the damage had already been done. It was an honest mistake. It doesn't reflect on the quality of our sponsors or our programs. It was just an honest mistake by a sign company. "It's been a rough few days. Unfortunately, these are the few things that get you on the map, we're doing a lot of good things with our sponsorship program and now all anyone will remember is this. We're creating partnerships not just with athletics, but also with the school district. There's a lot of colleges where the college is the town and the town is the college. We're trying to do that for our schools here in a similar way." While the mistake was clearly an honest one, the ramifications on Dimoff and the Red Lion area have been significant. 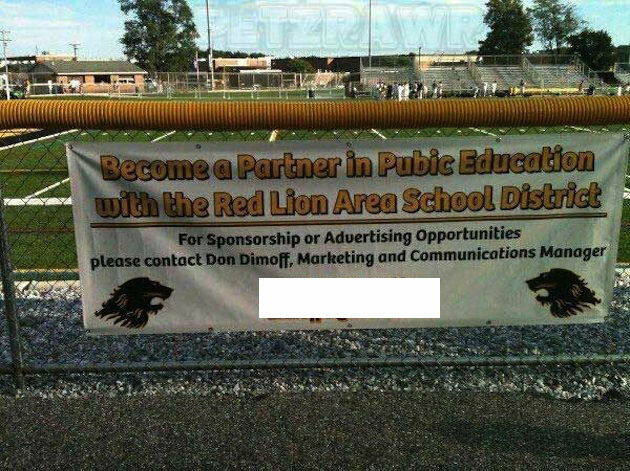 As the marketing and communications manager noted himself, the mistake helped put Red Lion on the map -- it's in South-Central Pennsylvania, in case you were wondering -- and drew all kinds of unwanted attention from outside the community to the school's sponsorship efforts. It also may have made Dimoff's job much more difficult, as he works to ensure all that are currently part of the sponsorship program that many more checks will be put in place over all future promotional materials ... especially stadium signs.